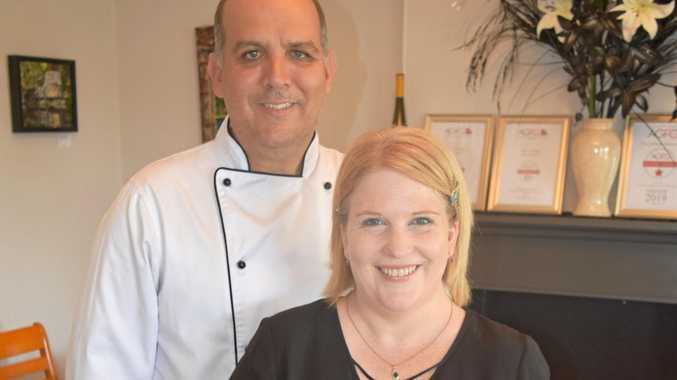 DINERS have helped Mark and Angela Naoum from The Cottage Restaurant win a national food award for the third consecutive year. Customers who ate at the restaurant voted for them in the Australian Good Food Guide (AGFG), giving them enough votes to receive a Readers' Choice Award. The AGFG Readers' Choice Awards are designed to give the public the opportunity to vote for their favourite establishments throughout the year. Since opening their establishment in 2016, they have been crowned winners with the AGFG. They were also the only winners announced in Ipswich. The husband and wife duo said they were "extremely happy" to receive another certificate which they could add to their restaurant's mantelpiece. "I think receiving a Reader's Choice Award is one of the best awards you could receive," Mr Naoum said. "It's the customers that come in and pay and vote for you. "It's more important to give them what they want other than a food reviewer." Voters commented on their restaurant's intimate dining areas, food and service. One reviewer described The Cottage Restaurant as "a gem in Ipswich town!" while another said "in this restaurant the chef makes a meal that is all about treating all elements with care and skill in presentation. One melds into another for sheer dining pleasure". Mr Naoum said he loved the layout of The Cottage and the intimate vibe they were providing for foodies. "People love that they can come here and know that it does have that intimate experience," he said. "We are a small boutique restaurant, and I love that." The award wouldn't have been possible without the community, which they are extremely thankful for. "We would like to thank everyone who has come in and supported us," Mrs Naoum said. "It's not just people in Ipswich who are coming here. It's also people from Brisbane and the surrounding regions." The pair are hoping to continue their winning streak in 2020, adding to their list of accolades.